Let’s keep it short and sweet. Glico Macadamia. 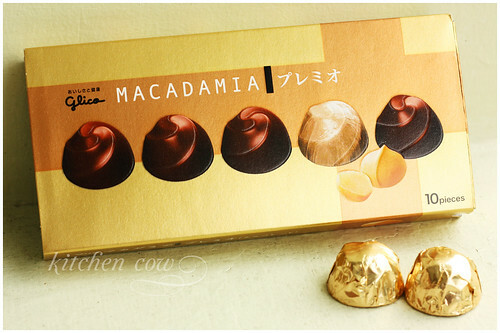 Yummy little nuggets of chocolatey goodness—whole pieces of macadamia nuts enrobed in silky, chocolate. Not quite dark chocolate or semi-sweet but it’s not your usual milk chocolate either. Where to find it in Manila? Help please! The box I ate was a gift from someone visiting from Japan. Unfortunately, I can’t locate any at my usual haunts. While I love Meiji Macadamia, there’s something special about Glico’s so I need to have more. If you know where I can buy some locally (I don’t want to resort to online shopping), please drop me a comment? This entry was posted in food spotlight and tagged asia, candy, chocolate, glico, japan, macadamia, manila, meiji, nuts, philippines. Bookmark the permalink. I love dark chocolate! And Meji brand is one of my favourites. I remember this little sweets shop at G4 that had these. Too bad they closed a year or so ago. I’ll keep an eye out for these goodies and pass any good news along! Congratulations on the nomination! Good luck! Wish you luck! Go Pinoy… Voted! Drat. But that's a good sign already. If someone used to import it, I'm sure other stores do as well. Sobra! Makakalimutan mo pangalan mo. I'll post here when I find some, so you can try too. Going to hunt around for them. Have you tried Hi-Top in Quezon Ave? Is that at your list of favorite haunts? They usually have a good assortment of Japanese goodies and chocolates.